CORAZZO PANNIER BAGS - $69 AFFORDABLE STORAGE SOLUTION - Scooter Central | Your One-Stop Scooter Shop! We can not get enough of the Corazzo Pannier Bags. These two lightweight, nylon bags fold into a compact size so you can stick them under the scooter seat when not in use. For only $69 a pair, they add a tonne of extra storage to your scooter! 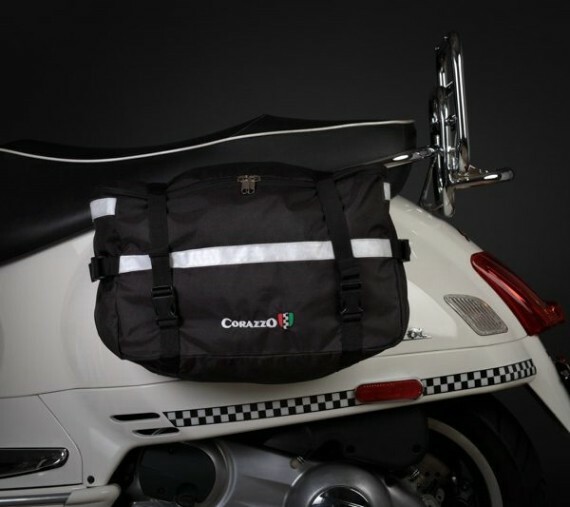 The nylon light weight Pannier Bags fold into a very compact size for ease of storing under the seat of a scooter. For all of us who need additional storage from time to time this product is ideal. When have you ever gone into a supermarket and only purchased the one item you needed? These bags offer a solution to the impulse buyer in all of us to get your things home in a secure and convenient way. The Pannier Bags are connected to each other by secure straps and fixed in place with Velcro. The width between the bags can be adjusted to fit any scooter perfectly and lock in place under your seat. There are strengthening straps that run all the way around the bag so even heavier items are secure. There are also adjustments on the sides and top to tighten up if your bag is not full. For the price of a pair of gloves you can have versatile and easily stored extra storage space when you need it. The bags come with Scotchlite 3M reflective material giving you extra visibility and the attractive Corazzo logo and shield embroidered on it for a stylish and functional appearance. This product is unique and one of the best purchases you will make. They will be tightly packed away under your seat until you need it.